When someone asks you to pray for them, pray for them right away. That person is bogged down with their burden, and there is no reason for you to leave them in their misery. It only takes you less than five minutes to lift their burden to the Lord. If you do not pray right away, you might forget to pray for them. If you tell someone you will pray for them and forget, you are not a person of your word. 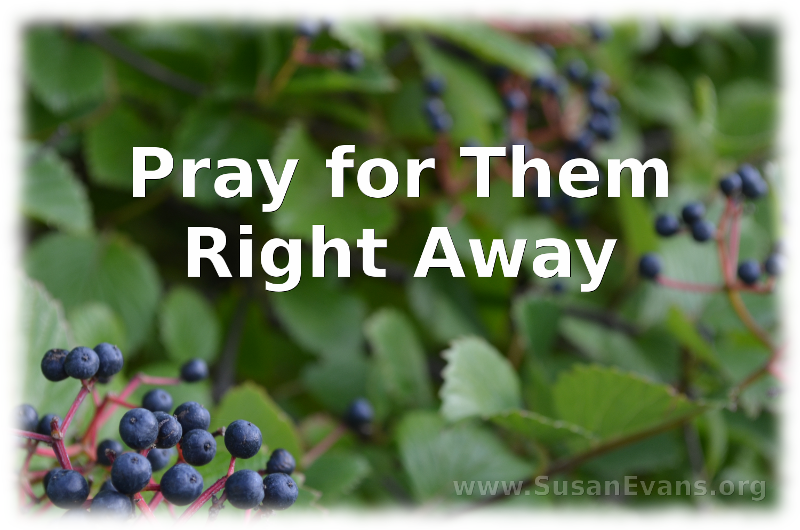 If you pray immediately, you have at least prayed for them once. The person receives immediate comfort if you pray with them out loud right then and there. The burden is lifted and divided when you pray for someone. That person will feel loved. We are commanded to love others, and what better way to show love to our brothers and sisters in Christ than to lift them up before the Lord in prayer. Get over your own self-absorption. An unbeliever might get saved if you pray for them. When God answers their request miraculously, they will know there is a God. Sometimes there is a demonic component that you are unaware of, and you need another believer to pray for you, and the fog is immediately lifted. It’s possible that the prayer request is a secondary issue, and that demonic oppression is the primary issue. If someone is asking for prayer, make sure to ask God if there is a demonic component, and that God would remove it from the person so that they can experience peace. If you help to remove a burden from a person, it frees that person up to minister to others. To follow my prayer posts, like my Prayer page on Facebook, YouTube, and Google+. This entry was posted on Friday, February 19th, 2016 at 8:00 am	and is filed under Prayer. You can follow any responses to this entry through the RSS 2.0 feed. You can skip to the end and leave a response. Pinging is currently not allowed. I need to remind myself, too! Um….cos’ God commands us in His Word to pray???? Yes, but when we pray while we are still with them, we won’t forget to pray for them, and they will have their burden lifted in that moment. That’s a great idea. Otherwise it’s so easy to forget. Good advice and a pertinent reminder that we should, “Pray without ceasing.” I would say that applies to praying for others as well. I need to try to do this more often. There have been times, I feel the Spirit prodding me to pray with someone and then I don’t. Thank you for this reminder. We should always follow through when God prompts us to pray for someone, since it only takes a couple of minutes and makes such a big difference in their lives. I especially agree with the first one. How often we forget to pray until we see the person again! It is also so comforting when someone prays with you. I have had my burden lifted immediately when someone stopped to pray with me. I try to never let someone who needs prayer walk away without me praying for them. These are great reasons. Too often we get distracted or don’t feel like we have time. We always have time to pray!